Two years of world war lie behind us. Contrary to all theories from political and economic experts on the anticipated duration of a modern war, world history has brought us this formidable experience - two years of world war and still no end in sight. Two years of world war. How much lies behind these five simple words! Enthusiastic heroism, adolescent zest, the manly, earnest performance of duty, loyal cameraderie to the death, proud joy and deep sorrow and much silent forsaking and painful sufferance. This is war. 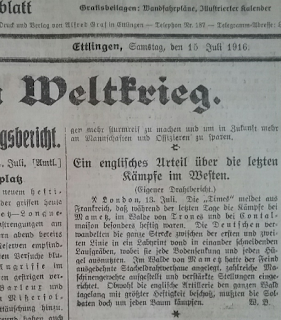 The memory of those first August days of 1914 remain unforgettable. When the German youth flocked to arms in droves, when they marched with melodious songs on their lips, when the entire German people forgot everything that separated them in unanimous patriotic enthusiasm and stood as one man against the enemy... and then came the days when our army roared through Belgium and Northern France like a storm wind and "the German cavalry rode almost to Paris". And the days when Hindenburg chased the murderous Russian troops out of Eastern Prussia and drove them back deep into their own country. And then came the days of trench warfare, when our armies stood in the East and the West as a protective wall of iron and fire in enemy territory, so that no enemy soldier would ever tread on our home soil. Until this spring the brave soldiers were called to new attacks and to defend the territory gained with fearless resistance. Two years of world war. What our troops have achieved and endured in this time cannot be put into words. Even the boldest imaginings of those at home cannot visualize what this war is in reality and what it demands from leaders and troops. We are only able, with extreme gratitude, to remember those who have achieved almost superhuman accomplishments. Who, with unprecedented courage, have held off the enormous dominance of the enemy from our borders, so that life in the homeland has continued as calmly as during peacetime. Let us also remember the sons of our people who gave their utmost - their lives - for the motherland, for us. Two years of world war! And in the homeland, we were not without our sacrifices. Particularly when the enemies send the hunger devil into our homes, because they realize their own military impotence. Be that as it may! Those at home can and want also to make sacrifices; besides, how negligible these are, compared with the sacrifices being made out there. They will not starve us out and we will not become faint-hearted, even if things become scarcer than in peacetime. We will survive! Two years of world war! And no trampled fields in the homeland, no burnt down villages, no devastated towns, no enemies in our country! Is that not a proud, uplifting thought, considering that half the world is against us? From a military perspective, they will not defeat us; from an economic perspective, they might be able to create difficulties for us, but they cannot starve us and the mood of the people and the army remains unbroken. These are the three strong roots of our strength to persevere, even in the third year of war. We do not know whether the war has reached its climax. Undoubtedly, the efforts of our opponents have never been more formidable than at this time. This requires heroism and courage out in the field and unity and solidarity at home. So let us cease our grumbling, only one will and one deed shall prevail - stay strong! Stay strong! Frederick the Great once wrote in the 7 Years' War: "I have high hopes and no matter how great the number of my enemies, I trust in my good cause, in the admirable bravery of the troops, and in their good will from marshal to the lowest soldier." In this trust, the homeland greets the armed forces. In this trust, let us hold together at home, so that everything will lead to a good end. This is our pledge on the second anniversary of the world war. 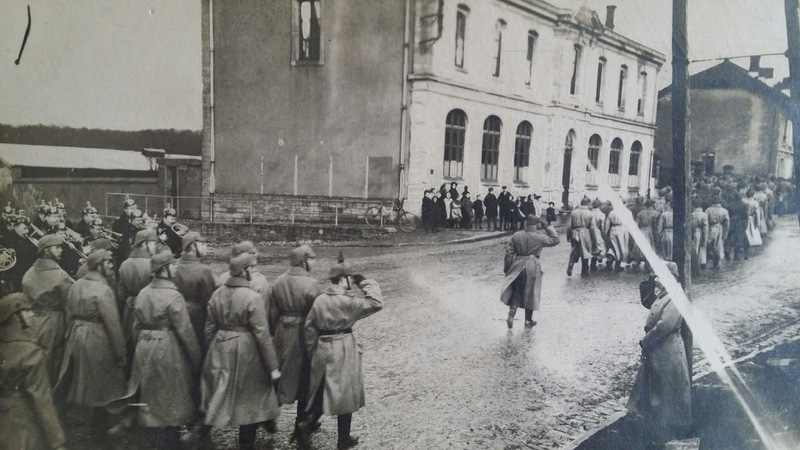 A German patrol advance resulted in the capture of 30 prisoners, including 3 officers, and 2 machine guns. 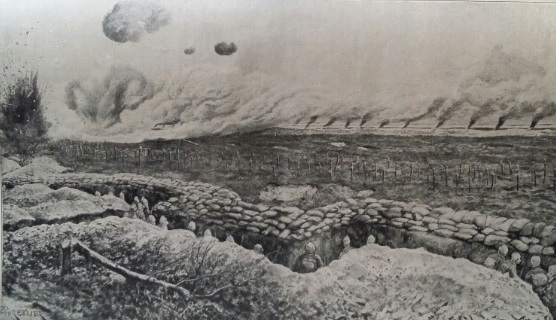 The English fire, which has increased to the highest level of intensity to the north of the Somme, was followed during the course of the afternoon by heavy attacks which completely collapsed at Pozières, as well as at Foureaux Wood and to the south-east of the wood in front of our lines. The attacks led to fierce close combat in Longueval and in Delville Wood; but here too, the enemy was unsuccessful. To the south of the Somme, both sides continued lively artillery activity and only enemy hand grenade troops advanced at Soyecourt. These advances were repulsed. To the east of the Maas, French attempts to capture Fort Thiaumont remained unsuccessful. Rotterdam, July 27, TU. The war correspondent who works for "The Times" and the "Daily News" in the English headquarters has sent his newspapers a detailed telegram containing only very little positive news. 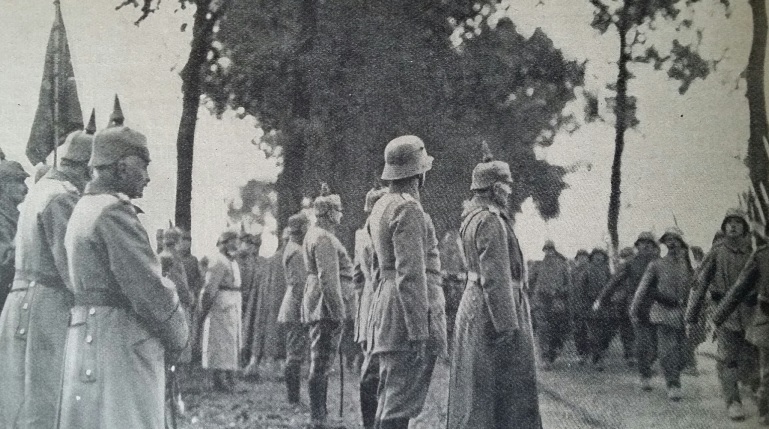 One believes that the Germans, after they cleared Pozières, have now occupied a new stronghold in the forest extending as far as the road to Bapaume. With the capture of Pozières, the second phase of the Battle at the Somme is deemed to be finished; the third phase will commence forthwith. 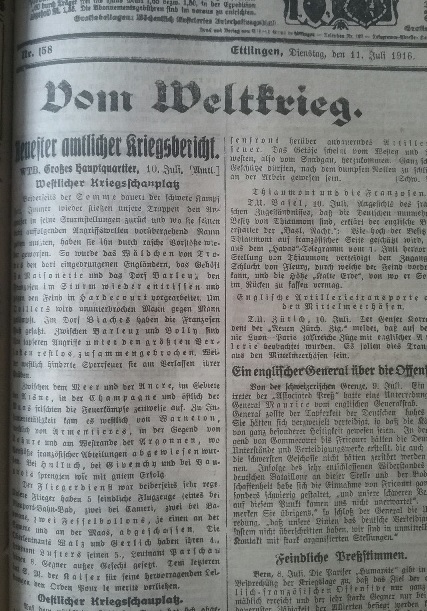 This correspondent also reports that the Germans have received further reinforcements of heavy artillery. 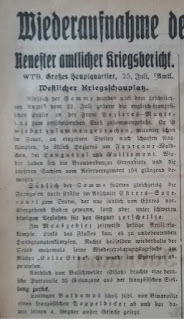 Hamburg, July 27 (TU). 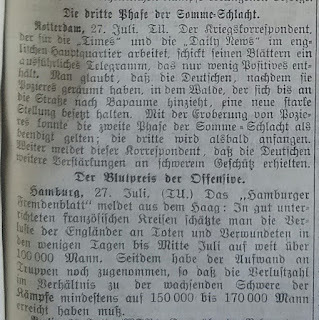 The newspaper "Hamburger Fremdenblatt" reports from The Hague: "According to well-informed French sources, the English losses in dead and wounded in the few days up to mid-July is estimated at well above 100,000 men. 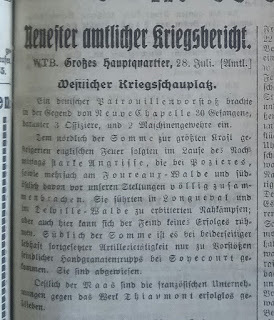 Since then, the number of additional troops brought in has further increased, so that the number of losses with regard to the growing intensity of battles must have reached at least 150,000 to 170,000 men". A German explosion has destroyed the large English bastion at the Comines-Ypres canal, together with its crew. To the north of the Somme, the English are staying at Pozières, following heavy fighting. Further east at Foureaux Wood and at Longueval, minor enemy advances have been repulsed. At Trones Wood, aggressive intentions were discerned and thwarted by fire. To the south of the Somme, we held ground gained to the south-west of La Maisonnette Farm in the night of July 25, against French attempts to reconquer it. Heavy close combat took place yesterday to the south of Estrées. At the Hill La Fille Morte (Argonne), the French occupied a crater they had blown up, but were buried by a German counter-attack shortly after. To the left of the Maas, our troops made some minor progress at Hill 304. Artillery fire took place during the night to the right of the river in the area of Fort Thiaumont. 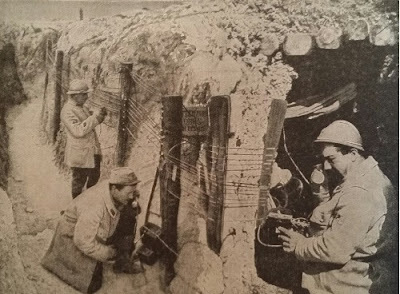 Enemy patrols were repulsed at several points along the Front. To the north of the Somme, two enemy planes were brought down in our lines by infantry and machine gun fire, one of them on fire after aerial combat, in the area of Luneville. A French bi-plane was shot down by a direct hit from an anti-aircraft gun in the direction of Fort Souville on July 24. To the north of the Somme, the English-French forces were brought together at the Pozières-Manre Front for a decisive thrust after the failed attack of July 22. The attempt once again broke down at various positions, partially during fire and following heavy close combat, in particular to the east of Pozières at Foureaux Wood, Longueval and Guillemont. The Brandenburg Grenadiers and the brave Saxons of Reserve Regiment 104 once again proved themselves magnificently. To the south of the Somme, the French simultaneously led heavy charges in the section of Estrées-Soyecourt, but only gained ground temporarily to the south of Estrées, Elsewhere the charges were smashed with heavy and bloody losses for the enemy. 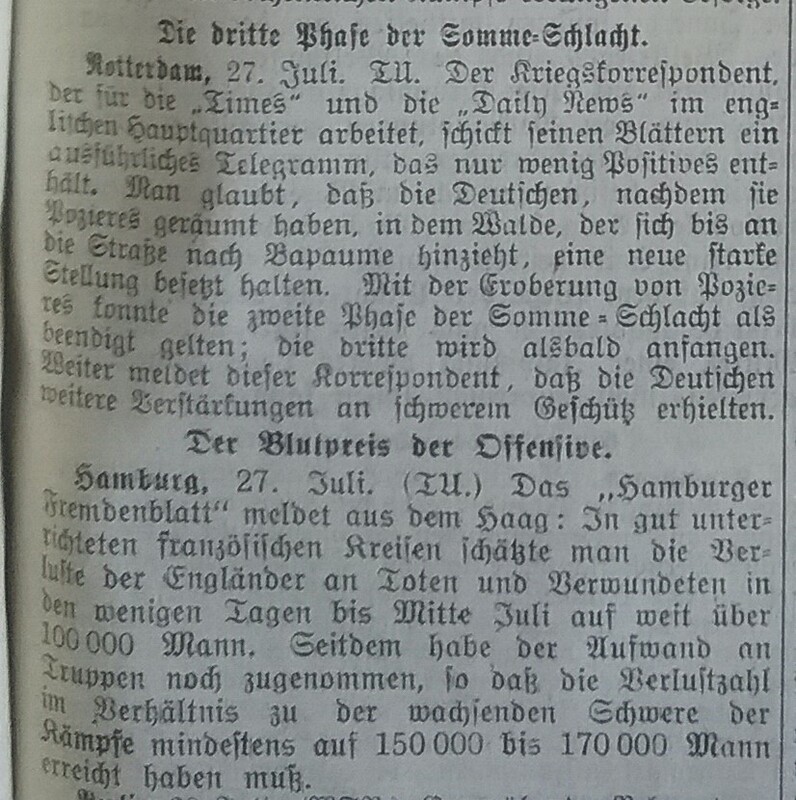 Intermittent heavy artillery battle in the area of the Maas. 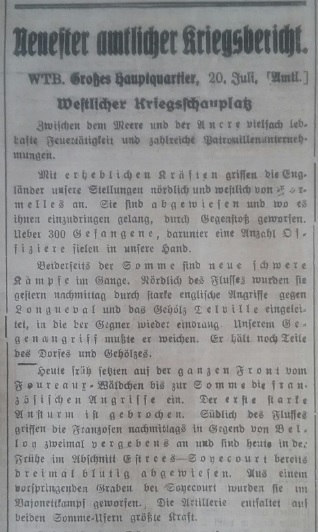 Insignificant hand grenade combat to the left of the river, To the right of the river, the enemy repeatedly attempted to reconquer the "Kalte Erde" ridge but were repulsed in curtain fire. 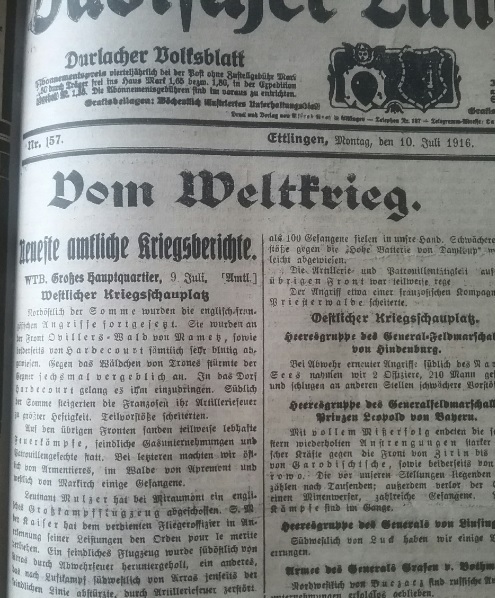 To the north of Balischweiler (Alsace), a German patrol captured 30 prisoners from the French trench. 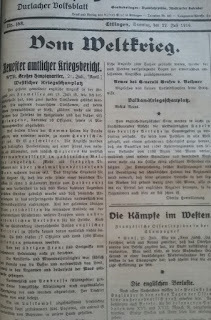 Leutnant Baldamus shot down a French bi-plane to the south of Binarville, thus putting his 4th opponent out of action. 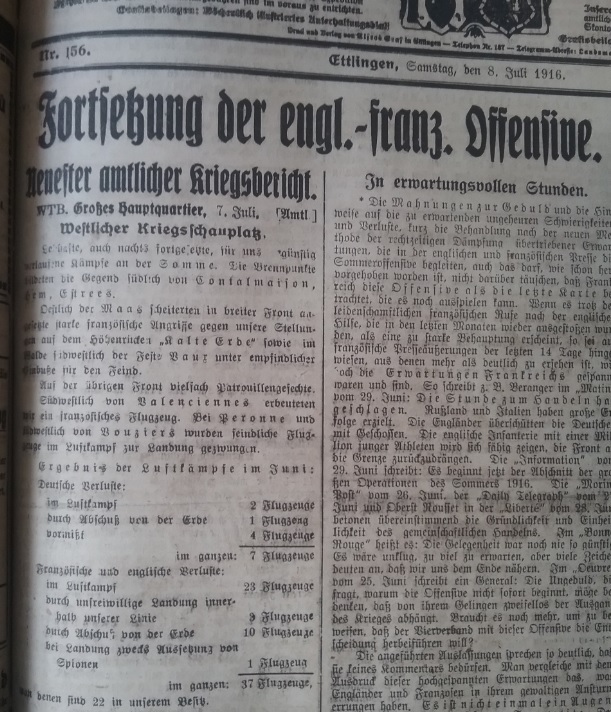 Apparently, the English attacks at the Thiepval-Guillemont Front reported yesterday were carried out by parts of 11 English divisions, several of whom were hastily called in from other Fronts. 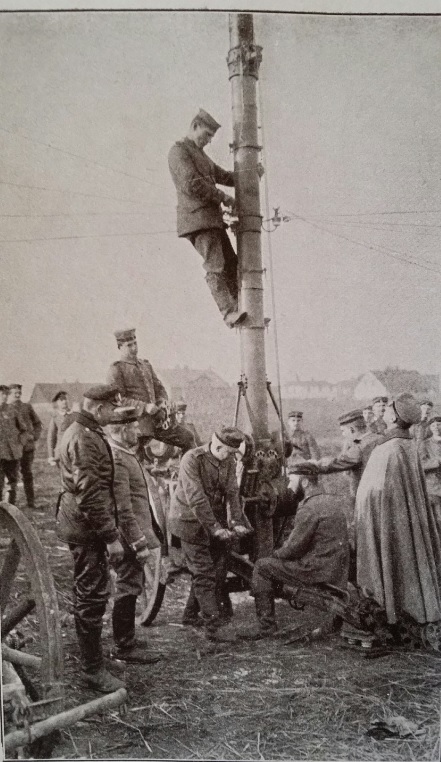 The enemy was only able to achieve one advantage along the entire line - the capture of several houses in Pozières - by suffering extremely heavy and bloody losses. As yet we have not been able to oust them. The heavy counterblow dealt to the enemy in Longueval was in glorious rememberance of the Brandenburg Grenadiers of Douaumont. To the south-west of Guillemont, we captured 3 officers and 141 men from a gravel pit in which the enemy had temporarily settled. To the south of the Somme, minor French operations at Soyecourt and to the west of Vermandovillers failed in our fire. The artillery battles are abating intermittently. According to current information, we have been able to capture 68 machine guns since July 15. To the right of the Maas, artillery battle on both sides has increased several times to enormous intensity. There was no infantry activity here. 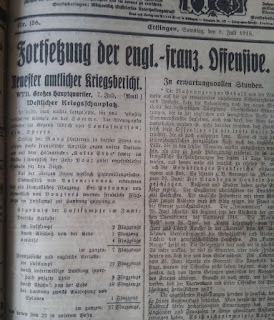 The "National Tidende" reported from Paris: The Germans were well prepared for the new joint French-English attack that commenced with artillery fire in the afternoon of the day before yesterday. Since yesterday, the infantry has also been involved. 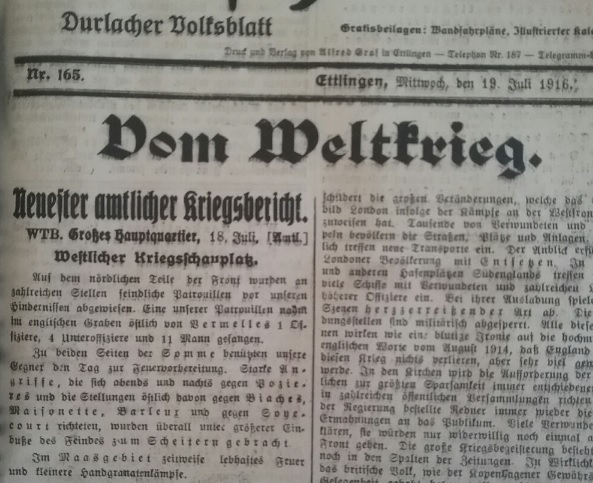 The Germans preempted the Allies' new advance by aiming a heavy attack against the English's right-hand wing. The place of attack was extremely wisely chosen as it was the point where the English and the French were consolidated. 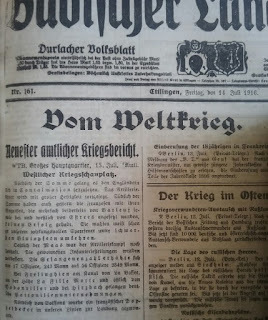 The Germans attacked only one position from 2 kilometers, with massive artillery fire. 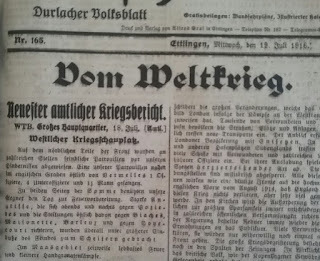 The result was that the English had to withdraw, but the Germans were not able to continue their advance. 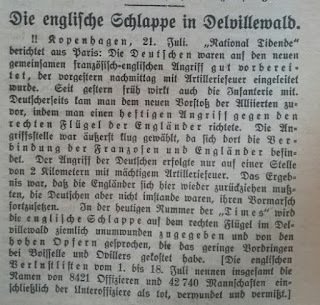 In today's "Times", the English setback on the right-hand wing in Delville Wood is admitted quite openly and the high number of victims that the minimum advance at Boisselle and Ovillers has cost has also been reported. 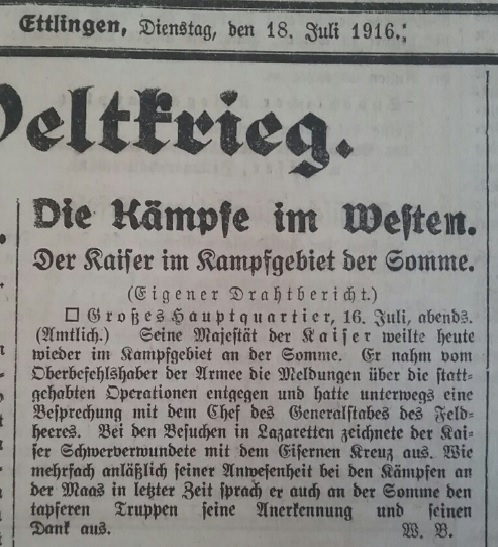 The English Lists of Casualities from July 1 to July 18 have named altogether 8,421 officers and 42,740 men, including non-commissioned officers, as dead, wounded and missing. The English attack reported yesterday in the area of Fromelles on July 19 was, it appears, carried out by two strong divisions. 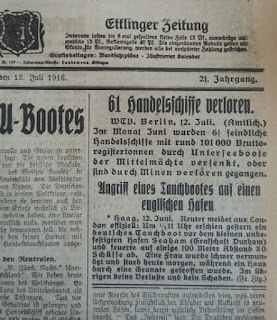 The brave Bavarian divisions, on whose section of the Front it struck, counted more than 2000 bodies of enemy soldiers in the forefield and have, up to now, delivered 481 prisoners, including 10 officers, as well as 16 machine guns. As expected, the enemy yesterday struck back on both banks of the Somme in a heavy attack. It failed. Following substantial preparations, the attacks were started in numerous waves along a front stretching across almost 40 kilometers, from the south of Pozières to the west of Vermandovillers. 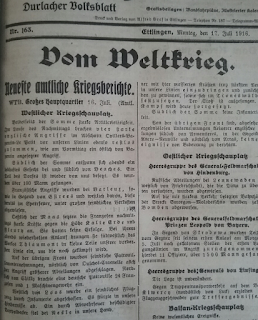 More than 17 divisions with over 200,000 men took part. The meager result for the enemy is that the first line of a German division located about 3 kilometers from Hardecourt was pushed out of the foremost trench lying in the 800 meters behind the village and that enemy units penetrated the forest protruding to the north-west of Vermandovillers. Along the rest of the Front, the raging attacks broke up thanks to our troops' fearless devotion to duty with extreme losses for the enemy. Even the unexpected deployment of English cavalry on horseback in trench warfare was unable to change the situation. 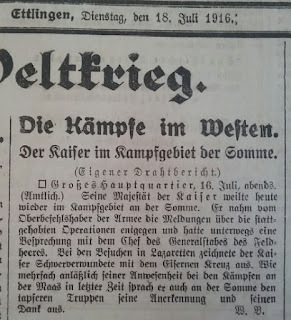 Up to now, 17 officers and around 1200 men have been taken prisoner. No significant events took place at the rest of the Front. Artillery and trench mortar activity increased to the south of the canal of La Bassee and to the north-west of Lens, as well as in the Argonne and both sides of the Maas. 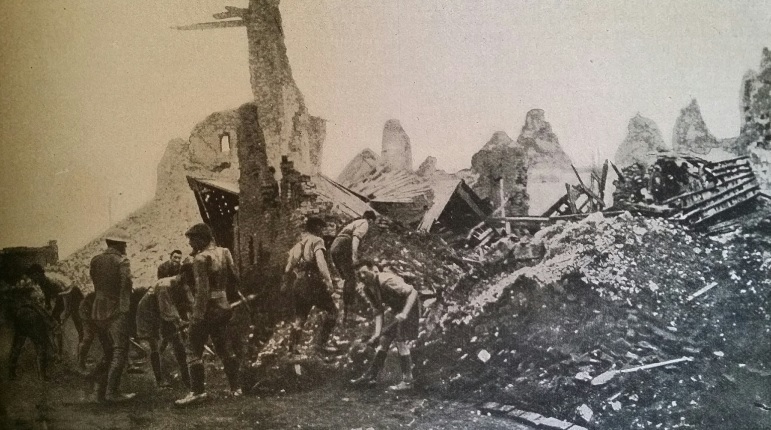 To the north-west of Vendresse (Aisne) minor French divisions advanced following unsuccessful blasting and were repulsed. We occupied the crater. 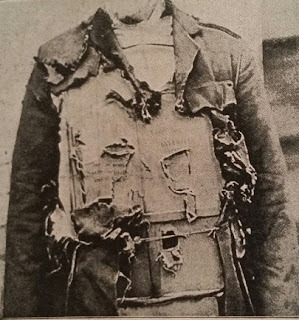 The wreck of an enemy plane shot down in aerial combat is lying to the south of Pozières, another has been captured by us to the north-east of Bapaume. Between the ocean and the Ancre, frequent lively fire and numerous patrol operations. The English attacked our positions with considerable force to the north and west of Fromelles. They were repelled and where they were successful in penetrating, they were repulsed in counter-attacks. We were able to capture more than 300 prisoners, including a number of officers. Fierce new battles are raging on both sides of the Somme. To the north of the river, they started yesterday afternoon with heavy English attacks against Longueval and Delville Wood, which the enemy once again infiltrated. They had to give way to our counter-attack. They still hold parts of the village and the forest. This morning, the French attacks started along the entire Front, from Foureaux Wood to the Somme. The first heavy storm attack was broken. To the south of the river, the French attacked twice unsuccessfully in the area of Belloy and were pushed back three times this morning in the section Estrees-Soyecourt with heavy losses. They were repulsed from an overhanging trench near Soyecourt in bayonet combat. The artillery is deploying maximum force on both banks of the Somme. At the Somme, the Magdeburg Infantry Regiment Nr. 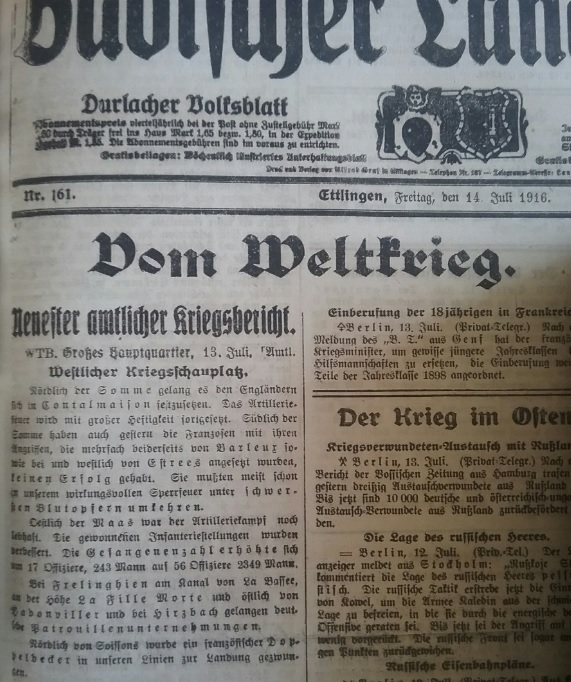 26 and the Altenburg Regiment last night recaptured the village of Longueval and the farm of Delville, which borders on the village to the east, from the English. In a fierce battle with heavy losses, we captured 8 officers, 280 men and a considerable number of machine guns. Enemy attacks against our position to the north of Pozières were suppressed by barrage fire and were not in the least successful at any point. To the south of the Somme, French attacks to the north of Barleux and at Bolloy failed; at other points, they did not progress beyond their initial attempts. 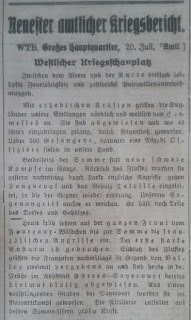 To the right of the Maas, the enemy continued their unsuccessful efforts against our line at the "Kalte Erde". 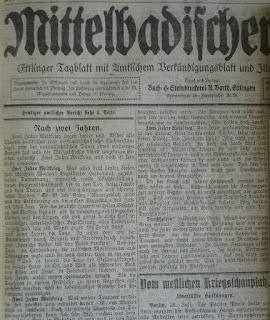 To the north of Ban de Sapt, a German patrol operation was successful. Enemy patrols were repelled before our barriers at several points along the northern part of the Front. 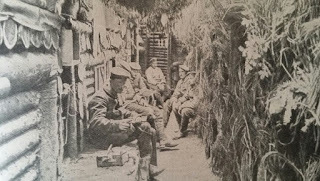 One of our patrols took 1 officer, 4 non-commissioned officers and 11 men prisoner in the English trench east of Vermelles. 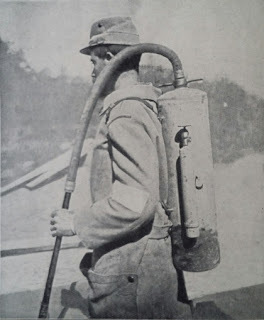 On both sides of the Somme, our opponents used the day to prepare for fire. 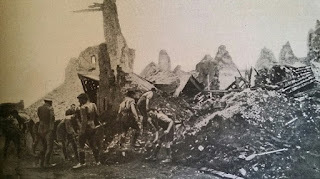 Heavy attacks in the evening and during the night, directed at Pozières and the positions to the east of it at Biaches, Maisonette, Barleux and Soyecourt were scuppered everywhere with heavy losses to the enemy. In the area of the Maas, intermittent lively fire and minor hand grenade skirmishes. Central Headquarters, July 16, evening (Official). 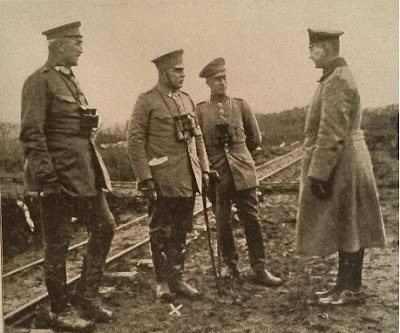 His Majesty the Kaiser once again spent time in the battle zone at the Somme. He accepted the messages regarding previous operations from the Commander-in-Chief of the army and had a meeting with the Head of the General Staff of the Field Army en route. 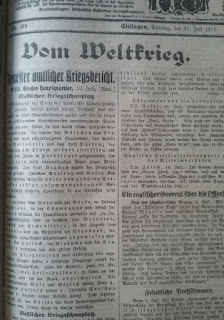 During his visits to the field hospitals, the Kaiser awarded severely wounded soldiers the Iron Cross. As he has done so often in his visits to the battles at the Maas in recent times, he also expressed at the Somme his recognition and thanks to the brave troops. Heavy artillery activity on both sides of the Somme. During the afternoon, four major English attacks completely broke down in the section Ovillers-Bazentin-Le Petit before our lines, following the breakdown of an enemy attack started in the morning to the east of Bazentin. To the south of the Somme, a lively battle near and to the south of Beaches came to an end. We have once again occupied a part of the village. 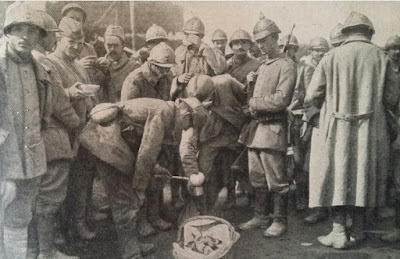 More than 100 men were taken prisoner. French attacks were repelled at Barleux, as well as in the area of Estrees and to the west of it in barrage fire. The enemy suffered heavy losses. To the east of the Maas, the French started heavy attacks at Kalte Erde Hill and Fleury. These were unsuccessful. They repeated the attempts in the evening and penetrated small parts of our foremost line to the south-west of Fort Thiaumont, where fighting continues. 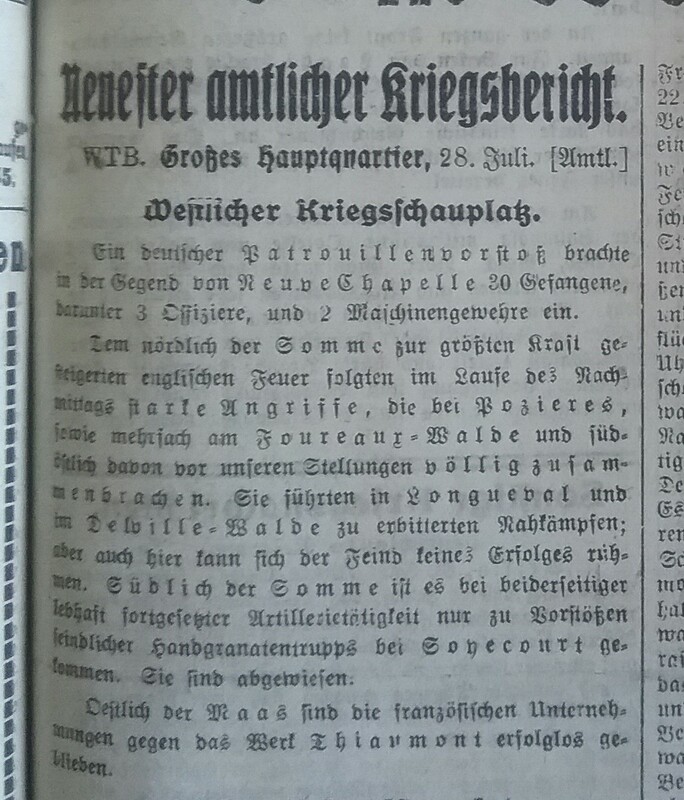 At other parts of the Front, enemy patrol activity to the north of Oulches-Craenelle as well as attacks by larger divisions have been defeated. To the north of Chilly, a German patrol captured 24 French and 1 machine gun. To the west of Loos, an enemy plane was shot down by infantry. It crashed in our barriers. 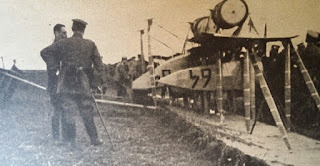 A bi-plane damaged by defensive fire fell into our hands at Nesle. London, July 13. 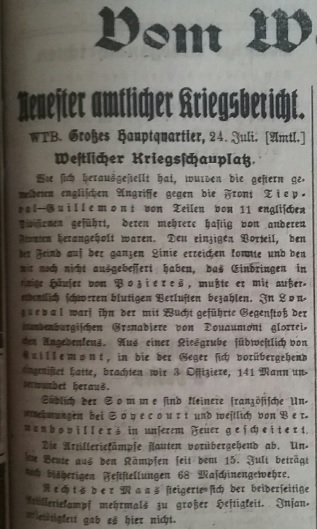 The "Times" reports from France that over the last few days, the fighting at Mametz, in Trones Forest and at Contalmaison has been particularly severe. 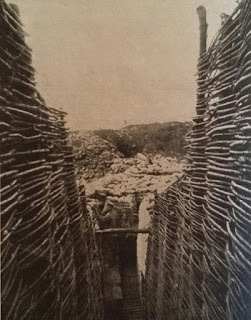 The Germans have transformed the entire route between the first and second lines into a labyrinth of communication trenches cutting into each other, exploiting every subsidence of ground and every hill. In Mametz Wood, the enemy has laid extended barbed wire fences, set up numerous machine guns and constructed fortified positions. 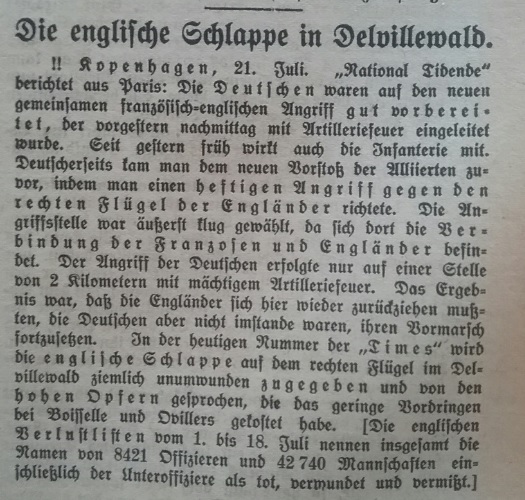 Although the English artillery bombarded the entire wood with the utmost intensity for several days, the soldiers still had to fight for every tree. To the north of the Somme, the English succeeded in gaining ground in Contalmaison. Artillery fire is being continued with heavy intensity. The French did not have any success yesterday with their attacks to the south of the Somme, which they implemented several times on both sides of Barleux and both in and to the west of Estrees. For the most part, they had to turn back due to our effective barrage fire, with much bloody sacrifice. To the east of the Maas, artillery battle was still very lively. The captured infantry positions were improved. 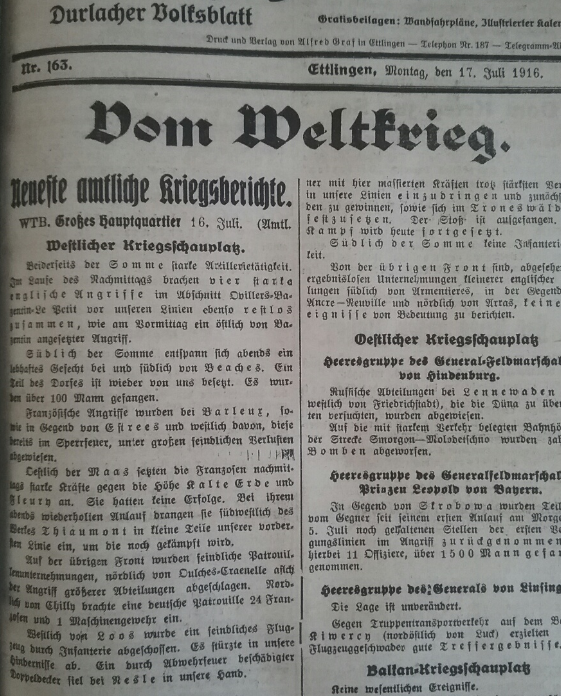 The number of prisoners increased from 17 officers, 243 men to 56 officers and 2349 men. 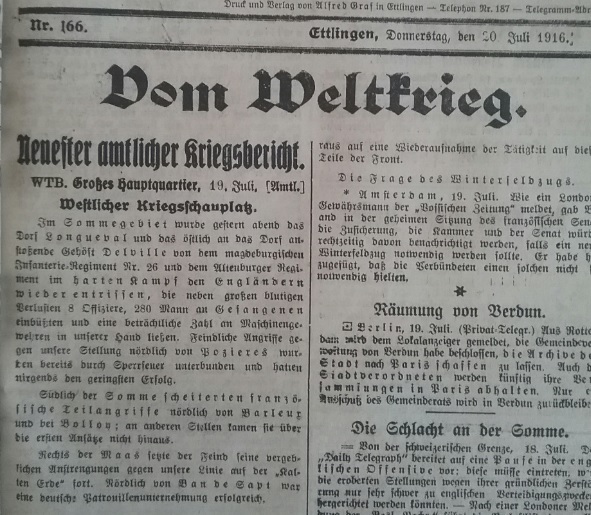 German patrols reached Frelinghien at the canal of La Bassee, the Hill La Fille Morte and to the east of Badonviller, as well as near Hirzbach. 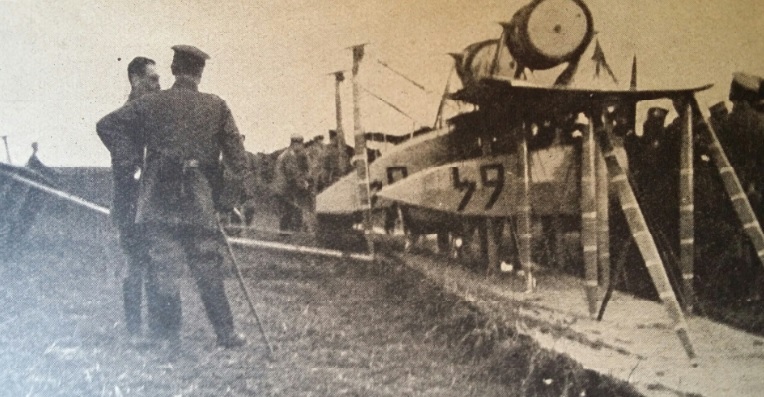 To the north of Soissons, a French bi-plane was forced to land in our lines. 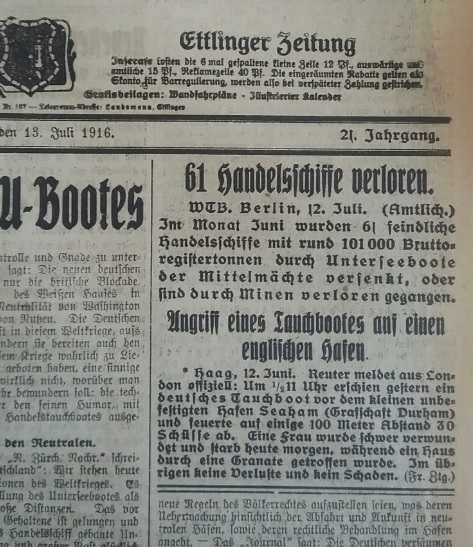 In the month of June, 61 enemy commercial vessels with around 101,000 gross register tons have been sunk by Central Powers' submarines, or have been lost due to mines. 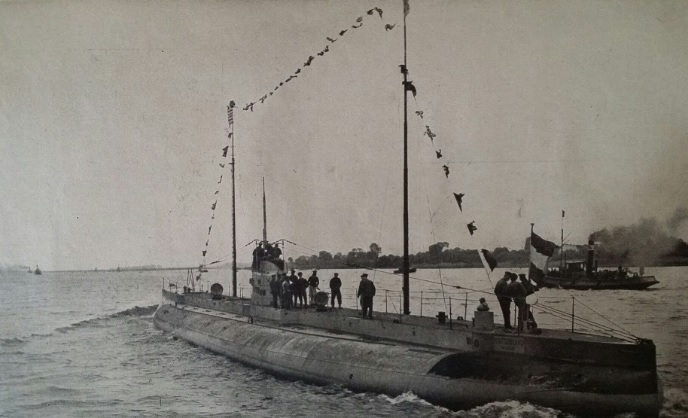 The first commercial submarine "Deutschland" in 1916. 29 men, all of whom are in the merchant navy. Haag, June 12. 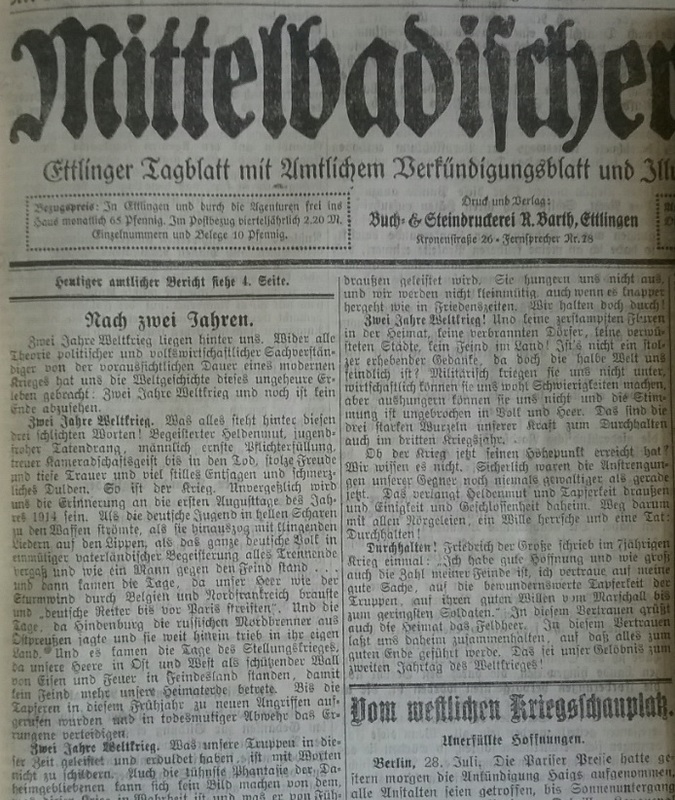 Reuter reports officially from London: At 10:30 yesterday, a German submarine appeared before the small, unfortified port of Seaham (County Durham) and fired 30 shots at several hundred meters' distance. A woman was severely injured and died this morning, while a house was hit by an artillery shell. Otherwise there were no losses and no damages (French newspaper). 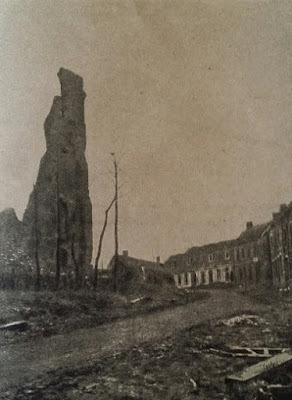 Between Ancre and Somme, the English implemented heavy attacks on both sides of the Bapaume-Albert road during the afternoon and the night. To the north-west of the road, they were shot down before close combat occurred. To the east of the road, heavy fighting is taking place at the southern edge of the village of Contalmaison and in Mametz Wood. The enemy's repeated attempts to capture Trones Forest failed, resulting for them in very heavy loss of life and our capture of 100 prisoners. To the south of the Somme, the French-African [sic] storming of La Maisonette Hill was met with overwhelming fire. 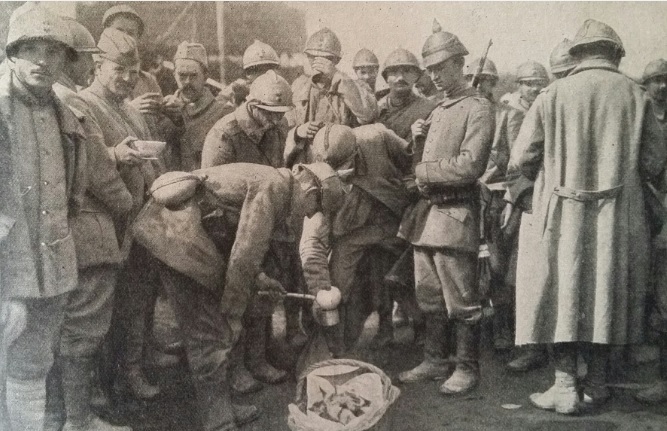 Some French-African troops who managed to penetrate our lines fell to German bayonets or were captured. We captured 5 officers and 147 men in the counter-attack on Barleux that was reported yesterday. Artillery activity was substantial in the entire combat sector. Our barrage fire prevented any chances of attack by the enemy between Belloy and Somecourt [sic: Sommecourt]. 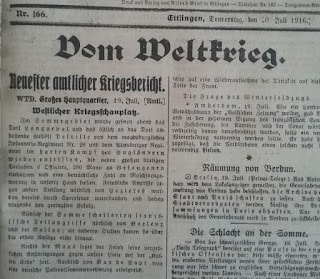 Extremely lively artillery battles took place in the area of the Maas. 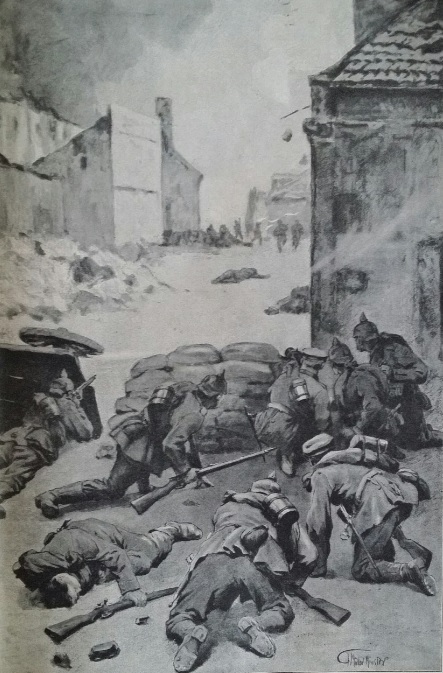 Increased fire and several unsuccessful gas attacks occurred at several points along the rest of the Front. There was a lot of activity by the enemy's patrol and reconnaissance divisions.They were repelled everywhere. 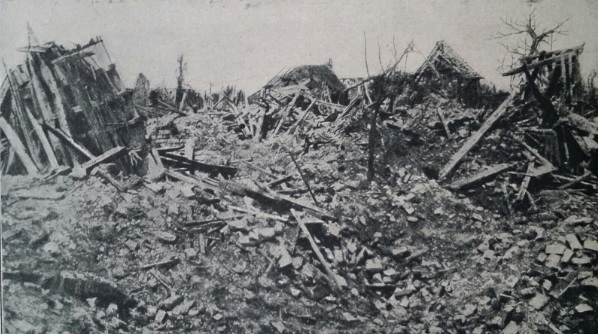 In Leintrey in Lorraine, a German division penetrated the heavily damaged French trenches following extensive blasting and took 60 men prisoner. 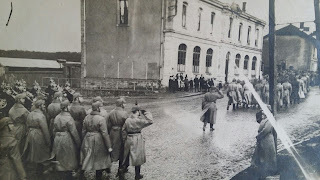 A patrol of prisoners was also taken south of Lousse. As a result of very lively aerial activity, numerous aerial battles took place, in which the enemy lost two planes at the Somme and to the west of Vouziers. In addition, an English bi-plane was brought down at Courcelette on the Bapaume-Albert road. Heavy fighting is continuing on both sides of the Somme. Again and again, our troops have repelled the attackers back to their storm trenches, and where they had to temporarily yield ground to close waves of successive attacks, they drove the enemy out again in rapid advances. Thus Trones Forest has once again been wrested from the English troops that had penetrated it, the farmstead of La Maisonette and the village of Barleux taken back from the French in a storming operation and the groundwork prepared against the enemy in Hardecourt. Continuous man-to-man fighting is taking place around Ovillers. The French have gained a foothold in the village of Biaches. Between Barleux and Bolly [sic: Belloy], their valiant attacks have completely collapsed with extremely heavy losses. 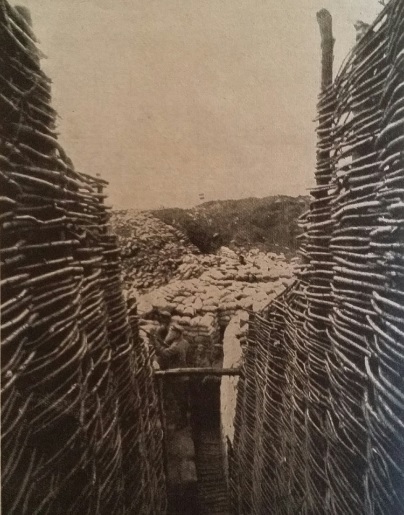 Further to the west, barrage fire has prevented them from leaving their trenches. Combat has intermittently flared up between the ocean and the Ancre, in areas of the Aisne, in Champagne and to the east of the Maas. Infantry activity occurred to the west of Warneton, to the west of Armentières, in the area of Tahure and on the western edge of the Argonne, where advances by French divisions were repelled. At Hulluch and Givenchy, our bombing attacks have been successful. Aerial combat has been very lively on both sides. 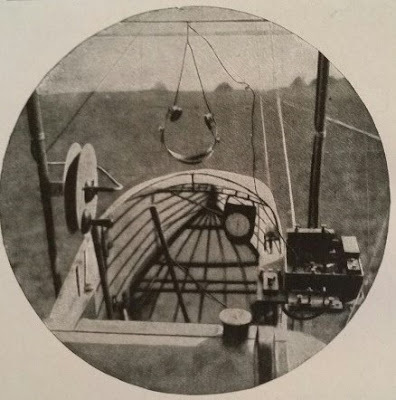 Our pilots shot down 5 enemy planes (one at Nieuport-Bahn-Bad, two at Canleri, two at Bapaume, and two captive balloons, one at the Somme and one at the Maas). 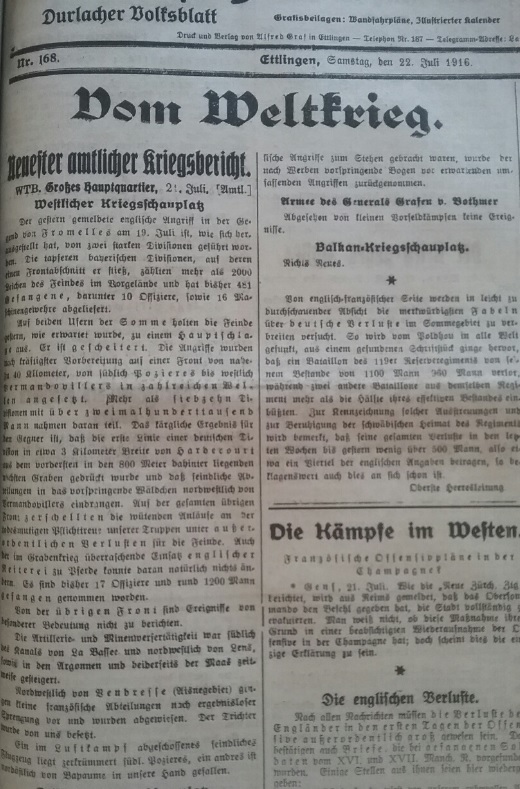 Oberleutnant Walz and Oberleutnant Gerlich put their 4th opponents out of action, Leutnant Lusters his 5th, and Leutnant Parschau his 8th. 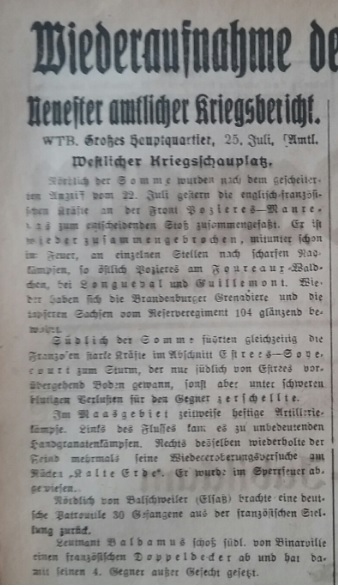 His Majesty the Kaiser awarded Leutnant Parschau the medal "Pour le merite" for his outstanding services. The English-French attacks continue to the north-east of the Somme. They have all been repelled with very heavy losses at the Ovillers/Mametz Wood Front, as well as both sides of Hardecourt. The enemy stormed Trones Wood six times in vain. They succeeded in penetrating the village of Hardecourt. To the south of the Somme, the French stepped up their artillery fire to the highest intensity. Partial advances failed. At other points along the Front, lively close fire combat, gas attacks by the enemy and patrol battles took place. In the latter, we took several prisoners east of Armentières, in Aprement Forest and to the west of Markirch. 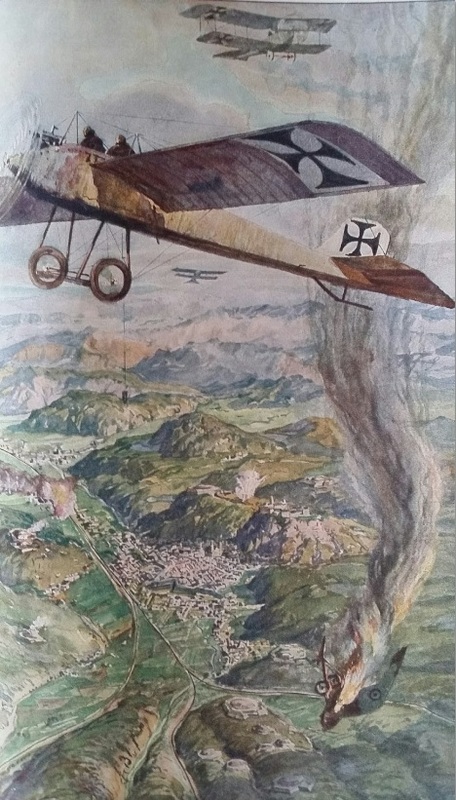 Leutnant Mulzer shot down an English large combat aircraft at Miraumont. His Majesty the Kaiser presented the well-deserved air force officer the medal "Pour le merite" in recognition of his accomplishment. An enemy aircraft was brought down south-east of Arras by defensive fire. Another was destroyed by artillery fire after crashing on the other side of enemy lines following aerial combat to the south-west of Arras. Lively battles at the Somme continued during the night, with unfavorable outcomes for us. The battles mainly took place in the area south of Contalmaison, Hem and Estrees. To the east of the Maas, heavy attacks across a broad section of the Front, instigated by the French against our trenches on the "Kalte Erde" ridge as well as in the forest south-west of Fort Vaux failed with considerable losses for the enemy. Multiple patrol skirmishes across the rest of the Front. To the south-west of Valenciennes, we captured a French plane. At Peronne and to the south-west of Vouziers, enemy planes in aerial combat were forced to land. Of these, 22 are in our possession.